Proof that ruckmen get better with age, Jolly’s career took the scenic route, spending time as a second-string ruckman at Melbourne, rising to prominence in Sydney before confirming his status as one of the best ruckmen of the 2000s at Collingwood. A man who covered the ground well for his size and was adept at switching to full forward to cause opposition coaches headaches with his height and overhead prowess. Jolly was a model of durability, playing 142 matches in a row between 2005 and 2011 and is best remembered by Collingwood fans as one of the keys to the 2010 premiership triumph. Originally from Lexton via the North Ballarat Rebels, Jolly had been out of the under-18 system for a year when chosen as a rookie by Melbourne and spent 2000 playing in the VFL alongside former Essendon ruckman Peter Somerville. A developing ruckman, he was already quite solid in the upper body which put him at an advantage compared to other young ruckmen. He was elevated to the senior list at the start of 2001 but sought a move elsewhere and was traded to the Swans at the end of 2004. Playing as second ruck to Jason Ball, he had a fine first year which was capped by a premiership medal in Sydney’s first flag since 1933. With Ball retiring after the premiership win, Jolly shouldered the ruck work and grew into one of the AFL’s best rucks. At the end of 2009, he signalled his intentions to return to Victoria and was eventually traded to Collingwood in exchange for draft selections No. 14 and No. 46. In his first year in the Black and White, Jolly became the big-bodied ruckman Collingwood fans had been pining for since the halcyon days of Damien Monkhorst. He began the year slowly, but by mid-year was starting to hit his straps, dominating against West Coast’s Dean Cox in round 14 (20 disposals, four goals and three Brownlow votes) and regularly pushing forward with great success, kicking 24.10 for the year. Jolly won 579 hitouts in total and rose to the fore in the Grand Final Replay against St Kilda when he won 35 hitouts, took six crucial marks (including one deep in defence in the shadows of half time) and pushed forward to add his name to the scoreboard. He ended the season with his second premiership medallion in a near best on ground display, and was 10th in the Copeland Trophy. It was business as usual in the early rounds of the following year, featuring in his first pre-season premiership and winning his share of 68 hitouts in the opening three rounds. Jolly missed his first match since round seven, 2005, in round four but returned on ANZAC Day to win 34 hitouts. He was then sidelined for nine weeks with a knee complaint and spent a fortnight in Arizona along with Dane Swan, Nathan Brown and Brent Macaffer mid-year to fast track his recovery. He marked his return in round 15 against the Hawks with two goals, but while steady, did not reach the heights of previous seasons. Jolly payed his 200th league game against Essendon in round 19, and nullified Eagles ruck duo Dean Cox and Nic Naitanui after they made a hot start in the Qualifying Final. He strained his groin in the Preliminary Final, but bravely soldiered on in the Grand Final loss where he managed 34 hitouts but only nine disposals. Now in the veteran class, Jolly was effectively managed throughout 2012 missing rounds six and seven with Achilles soreness and then rounds 10, 18 and 22 to keep him fresh, and was influential in round 20 against the Swans and in the Qualifying Final against Hawthorn. Unfortunately, Jolly’s fourth and final season at Collingwood did not end the way he would have hoped. It was a difficult season for the dual premiership veteran, starting it as the club’s number one ruckman but finishing without a place on the list as the Magpies turned to youth. Jolly kicked off the year with 22 hitouts against the Kangaroos in the first round but was substituted out of the clash with Carlton seven days later after hurting his ribs and didn’t reappear until round six. He then put together seven weeks of consistent football highlighted by his 40 hitouts, a goal and 18 possessions against the Lions at the Gabba. t was enough to earn him two Brownlow votes, so few would have predicted that the twilight fixture at Docklands against the Western Bulldogs a fortnight later would be his last in Black and White. Jolly’s knee required minor surgery following the mid-season break, an injury that eventually paved the way for the debut of South Australian wunderkind Brodie Grundy. Despite returning for four VFL games late in the year, Jolly couldn’t edge out the youngster as Collingwood settled its line up ahead of September. Jolly’s four-year tenure at the Westpac Centre ended with 43 hitouts in the VFL Elimination Final against the Borough at North Port Oval. After a quiet start, Jolly was a key factor in his side’s ability to close within seven points midway through the final quarter. 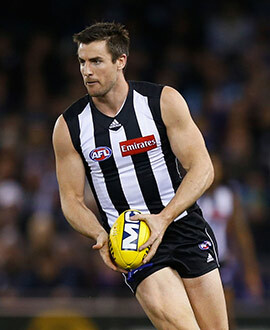 Sadly, Port ran away with a 25-point win and Jolly was not offered a new contract in the weeks that followed. While his departure did not follow the script, Jolly will always hold a place alongside Luke Ball as the experienced men who delivered Collingwood’s 15th premiership cup within months of their arrivals.